2004 American Idol photos © Chris Walter. These photos may not be copied, linked to or published in any form without permission, including on websites. Terri Seymour at party to celebrate the American Idol Top 12 Finalists at Pearl in Hollywood. Taylor Emerson from TV show "Oliver Beene" at party to celebrate the American Idol Top 12 Finalists at Pearl in Hollywood. Andrew Lawrence from TV show "Oliver Beene" at party to celebrate the American Idol Top 12 Finalists at Pearl in Hollywood. Ryan Seacrest, host of American Idol, at party to celebrate the American Idol Top 12 Finalists at Pearl in Hollywood. Andrew Lawrence of TV show "Oliver Beane" at party to celebrate the American Idol Top 12 Finalists at Pearl in Hollywood. Daveigh Chase of TV show "Oliver Beane" at party to celebrate the American Idol Top 12 Finalists at Pearl in Hollywood. American Idol Judges Simon Cowell, Paula Abdul and Randy Jackson at party to celebrate the American Idol Top 12 Finalists at Pearl in Hollywood. Simon Cowell at party to celebrate the American Idol Top 12 Finalists at Pearl in Hollywood. Simon Cowell and Terri Seymour at party to celebrate the American Idol Top 12 Finalists at Pearl in Hollywood. Simon Cowell (American Idol judge) and Terri Seymour at party to celebrate the American Idol Top 12 Finalists at Pearl in Hollywood. American Idol Top 12 Finalists at party to celebrate the American Idol Top 12 Finalists at Pearl in Hollywood. Camile Velasco - American Idol Finalist at party to celebrate the American Idol Top 12 Finalists at Pearl in Hollywood. Fantasia Barrino - American Idol Finalist at party to celebrate the American Idol Top 12 Finalists at Pearl in Hollywood. George Huff - American Idol Finalist at party to celebrate the American Idol Top 12 Finalists at Pearl in Hollywood. Amy Adams - American Idol Finalist at party to celebrate the American Idol Top 12 Finalists at Pearl in Hollywood. Diana DeGarmo - American Idol Finalist at party to celebrate the American Idol Top 12 Finalists at Pearl in Hollywood. Jon Peter Lewis at party to celebrate the American Idol Top 12 Finalists at Pearl in Hollywood. Matthew Rogers - American Idol Finalist at party to celebrate the American Idol Top 12 Finalists at Pearl in Hollywood. 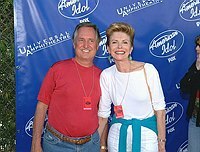 John Stevens - American Idol Finalist at party to celebrate the American Idol Top 12 Finalists at Pearl in Hollywood. Leah LaBelle - American Idol Finalist at party to celebrate the American Idol Top 12 Finalists at Pearl in Hollywood. Jennifer Hudson - American Idol Finalist at party to celebrate the American Idol Top 12 Finalists at Pearl in Hollywood. LaToya London - American Idol Finalist at party to celebrate the American Idol Top 12 Finalists at Pearl in Hollywood. Jasmine Trias - American Idol Finalist at party to celebrate the American Idol Top 12 Finalists at Pearl in Hollywood. Penny Johnson Jerald of TV show 24 at party to celebrate the American Idol Top 12 Finalists at Pearl in Hollywood. Reiko Aylesworth of TV show 24 at party to celebrate the American Idol Top 12 Finalists at Pearl in Hollywood. at American Idol 3 Finale, Kodak Theater in Hollywood, May 26th 2004. Ryan Seacrest (show host) at American Idol 3 Finale at the Kodak Theater in Hollywood. May 26th 2004. American Idol Winners. 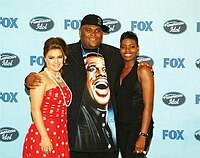 Kelly Clarkson (series1) Ruben Studdard (series2) and Fantasia Barrino, winner of American Idol 3, at American Idol 3 Finale, Kodak Theater in Hollywood, May 26th 2004. 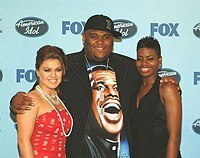 Fantasia Barrino, winner of American idol 3, at American Idol 3 Finale, Kodak Theater in Hollywood, May 26th 2004. Fantasia Barrino , 2004 Winner, at American Idol 3 Finale at the Kodak Theater in Hollywood. May 26th 2004. Fantasia Barrino, 2004 Winner, at American Idol 3 Finale at the Kodak Theater in Hollywood. May 26th 2004. Fantasia Barrino, winner of American Idol 3,at American Idol 3 Finale, Kodak Theater in Hollywood, May 26th 2004. Simon Cowell (judge) at American Idol 3 Finale at the Kodak Theater in Hollywood. May 26th 2004. Simon Cowell, American Idol Judge. at American Idol 3 Finale, Kodak Theater in Hollywood, May 26th 2004. Diana DeGarmo, runner up at American Idol 3 Finale, Kodak Theater in Hollywood, May 26th 2004. Diana DeGarmo , runner up, at American Idol 3 Finale, Kodak Theater in Hollywood, May 26th 2004. Diana DeGarmo, runner up, at American Idol 3 Finale, Kodak Theater in Hollywood, May 26th 2004.